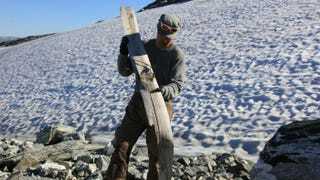 Archaeologists working in Norway have found a 1,300 year-old ski with the binding and leather straps still attached. The discovery, made possible because of melting ice, shows that Vikings were able to move fast and steady on the snow. It's one of only 20 pre-modern skis to be found in Norway, and only the second with bindings (the other being from Finland). Photo credit: Oppland County Authority.